Πατήστε τη φωτογραφία και δείτε όλες τις φωτογραφίες του Bisser Hotel. Διαθέσιμο WiFi σε όλους τους χώρους, Εστιατόριο, Μεσημεριανό γεύμα σε πακέτο, Μηχάνημα αυτόματης πώλησης (για ποτά), Εξωτερική πισίνα, Εξωτερική πισίνα (εποχική), Μεταφορά από και προς το αεροδρόμιο, Ενοικίαση αυτοκινήτου, Μεταφορά (με επιπλέον χρέωση), Μεταφορά από/προς το αεροδρόμιο (με χρέωση), 24ωρη ρεσεψιόν, Θυρίδα ασφαλείας , Οργάνωση εκδρομών, Χώρος φύλαξης αποσκευών, Θυρωρείο, Κήπος, Αίθριο, Ηλιόλουστη βεράντα, Παιδική χαρά, Καθημερινή υπηρεσία καθαριότητας, Κατάστημα δώρων/αναμνηστικών, Καταστήματα (στις εγκαταστάσεις), Μίνι μάρκετ στις εγκαταστάσεις, Δωμάτια για μη καπνίζοντες, Οικογενειακά δωμάτια, Κλιματισμός. Hotel Bisser is set right next to the former residence of Romania's Queen Maria and Balchik Botanical Garden. The sea shore is in front of the hotel and there is direct access to it through stairs. The beach of the Castle is only 3-minute walk from the hotel. On site free WiFi and paid private parking are available. At the property guests can enjoy views of the sea, an outdoor swimming pool with sun loungers and a children's section with a playground. All rooms come with cable TV and almost all have air conditioning. Hotel Bisser offers buffet breakfast and provides discounts and reservations for various restaurants nearby. The property has a private park, where guests can relax or enjoy outdoor activities. 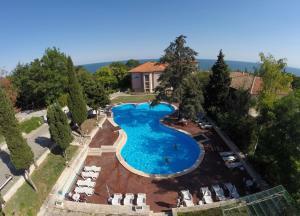 The hotel is located 35 km away from the city of Varna and 46 km away from Varna Airport. Please note that no toiletries are provided in the bathrooms. Please note that the outdoor seasonal pool is operational from 1 June to 15 September every year. Please note that cash payments at the property are done in the local currency (BGN leva). Please note that towels and bed linen are not changed daily. Guests requiring a confirmation letter from Bisser Hotel for visa purposes have to pay in advance the entire amount of the reservation. Please contact the property directly for further information. Payment before arrival via bank transfer is required. The property will contact you after you book to provide instructions. In the event of an early departure, the property will charge you the full amount for your stay. Parking is subject to availability due to limited spaces. Please inform Bisser Hotel in advance of your expected arrival time. You can use the Special Requests box when booking, or contact the property directly with the contact details provided in your confirmation.